Seller just reduced by $10,000! Motivated to sell! 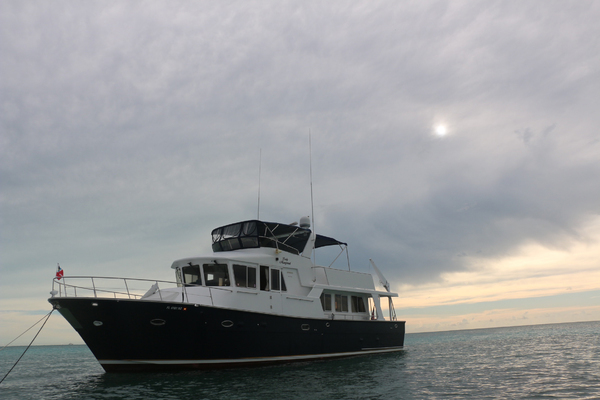 This beautiful 57' Jefferson Pilothouse is the very desirable wide body version with full beam salon and day head. A stout appearing vessel that will take you safely to most any remote destination in style and comfort. Stabilized with bow thruster and twin Detroit DDEC engines, she will cruise comfortably, appreciated by your crew. 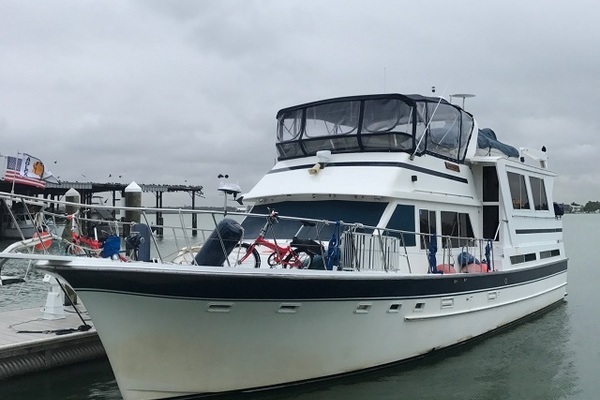 Heavily built for comfortable cruising in a wide range of conditions, extended cruises are made easy and economical in this 57' Jefferson Pilothouse. Semi-displacement hull with hard aft chines has deep prop-protecting keel. Her interior is open and spacious with natural and accent lighting throughout. She boasts beautiful woodwork in teak and burl with solid mahogany flooring, carpet overlays and plush soft goods, salon day head, home size galley with ample storage, expansive pilot house with centerline helm. Large windows, ports, and overhead hatches bring in the beauty of natural light and ventilation. All windows have interior curtains and there are newer electrically controlled miniblinds installed in the pilothouse for sun protection and privacy of the windshield. Below decks she features three staterooms, an amidships master suite with large head and tub/shower combination, VIP stateroom forward with large head, guest stateroom room to port with upper and lower berths, all with plenty of storage. Her exterior flybridge features a spacious and functional helm station, a Portuguese forward deck with ample seating, wide walk-around, covered aft deck and an integrated swim platform. There is a large aft bridge deck, which stores a Novurania Center Console hard bottom inflatable tender with a 40 HP 4 stroke Yamaha and a Steelhead Marine 1,000-pound hydraulic launching davit. The bridge also has a spacious entertaining area with wet bar and guest seating. This yacht is the one to consider for anyone looking for a cruising yacht or live aboard.  Easy to see in New Bern, NC (EWN) with jet service via American or Delta Airlines. No disappointments. The seller’s change of plans dictates the sale. I guarantee the boat is shown as in the listing or I reimburse your travel! No disappointments! As you approach the Jefferson 57 PH and the beautiful blue hull and raked forward windows you realize you are about to board a stout and well-built vessel. The WOW factor is front and center. Step onto the swim platform and through the port side transom door into the aft deck. There are also port and starboard boarding doors outboard of each pilot house door. The aft deck is large and offers overhead protection with the extended bridge deck. Along the port side is a storage locker with upper and lower cabinets. There is a large aft deck lazarette with a stainless-steel ladder for added storage, access to the water maker and inverter. Aft are additional shore power connections and a hot and cold-water shower. There are fiberglass steps along the starboard side that open to reveal access into the engine room. The engine room is large and offers stand up headroom. All machinery and equipment is within easy reach and maintenance is easy with 360-degree access around the engines. Into the salon by way of the sliding door. The salon is beautiful with wonderful wood trim, panels and cabinets. Large windows offer excellent natural light and there are wood blinds for privacy. Along the port side is a beige leather L-Shaped settee with a high-low table with two leaves. Forward is a built-in end table and a day head with Vacu-Flush head and vanity. Along the starboard side is are beige leather Stress Less chairs and matching ottomans. Aft is a built-in end table. All the way forward and starboard is the entertainment cabinet with a flat screen TV in the cabinet with a rolling wood door, access to DVD and CD players, ample storage cabinets and drawers and stainless steel ice maker and trash compactor. Up two steps you enter the pilot house deck with galley. The U-Shaped galley is along the starboard side and offers excellent food storage and preparation spaces, large appliances and granite counter tops. The dinette is to port with a high-low table. Port and starboard pilot house sliding doors lead to the side decks for access to the bridge. The pilot house is forward with a center helm chair. All engine and navigation instruments are centrally located and within easy reach. The electrical panels are to starboard. Newer electric controlled blinds on the windshield can be lowered for privacy and sun protection. Along the port side are slightly curved steps leading to the cabin spaces. Immediately aft is the master stateroom with a queen-line berth with a mirrored aft bulkhead and padded headboard. Along the starboard side is a large storage cabinet with drawers and cabinets. Port and starboard nightstands have storage as well. Along the starboard side is a large hanging locker and aft is the master head complete with Vacu-Flush toilet, vanity and medicine cabinet and a bath tub and shower combination with folding shower door. Exiting the master and along the starboard side is a laundry center with a stacked full-size GE washer and dryer. The guest stateroom to starboard features upper and lower berths with storage. Across from the guest stateroom is the shared head with shower stall, Vacu-Flush toilet and ample storage. All the way forward is the VIP stateroom with a center-line queen berth, ample storage cabinets and drawers. Along the port side is private access into the head. Back to the pilot house doors, out to the side decks and forward is access to the Portuguese bridge with a port side door to the foredeck. There is a built-in settee in front on the bow deck and storage within the Portuguese bridge. Aft of the pilot house doors are port and starboard steps up to the bridge deck. The bridge deck is huge and offer L-Shaped port and starboard settees with beautiful striped blue Sunbrella fabrics, storage and high-low tables on each side. Aft in the center is a door to the aft bridge deck where the RIB and dingy davit is. To starboard and well protected with added rails is the hatch leading down to the aft deck. Forward in the bridge deck along the starboard side is a wet bar cabinet with stainless steel sink, storage and a U-Line refrigerator with ice maker. Up two steps are the Helm deck with a full three-side blue Sunbrella enclosure with Sunbrella plus used for the bimini. Seating along the port side will seat a crowd and covered in matching blue striped Sunbrella. he two Pompanette helm seats are adjustable with a foot rest. The helm is centered and well laid out with all instrumentation and gauges within easy reach. There is additional storage under the helm brow with port and starboard doors. The beautiful gourmet galley is the heart of this home at sea. The furniture grade high gloss teak cabinetry with matching fabrics and granite counter tops surround the full-size appliances. The galley is up, aft and to starboard, in the pilothouse while the dinette seating is to port. Large and well equipped, the galley will please even the most discriminating chef. Beautiful pilothouse electrical panels for AC and DC protected by a dark glass and wood cabinet door. Within easy reach and readily accessible. All pilot house and bridge electronics are within easy reach and viewing. Access to the large stand-up engine room is through the opening steps on the aft deck. Ample space to maneuver easily about the engine room making maintenance a breeze. Well-built with slightly raked pilot house windows for reduction of glare, fiberglass hull and Nidacore used in decks, super structure, and engine room bulkheads. You owe it to yourself to see this stout, appealing motor yacht that turns heads in any marina. Ready to show and ready to go. 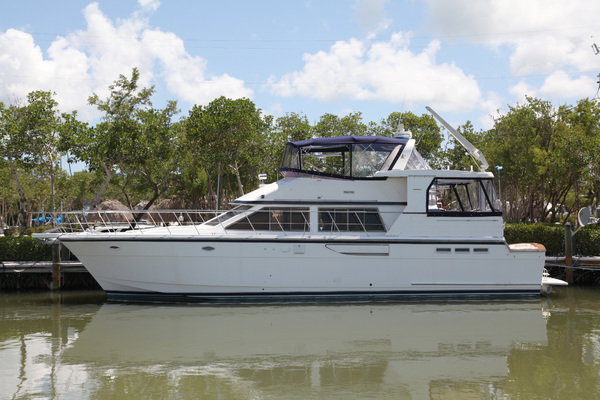 Our Jefferson listing is a great opportunity to purchase a very nice 57' Pilothouse. 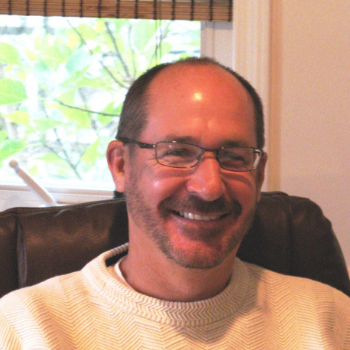 She is currently listed with United Yacht Sales broker John Peterson who can answer all questions about the boat for you. Please don't hesitate to reach out to our team of professional yacht brokers to schedule a showing. There are many yachts listed for sale on the MLS each with a different history. We look forward to helping you complete your search for the perfect boat or yacht for sale.